1. Takeover talk: Discovery Communications (DISCA), which owns TLC and Animal Planet, is acquiring Scripps Networks (SNI), which owns Food Network and HGTV, in an $11.9 billion deal. The deal has been in the works for several weeks. It's valued at $14.6 billion, or $90 per share, counting Discovery's assumption of Scripps' debt. Viacom also pursued Scripps but backed out of the bidding war last week. Meanwhile, Charter has shot down a plan for it to buy Sprint and create a media and telecom giant. The proposed merger would have resulted in a huge new company controlled by Sprint's (S) owner, the Japanese tech firm Softbank (SFTBF), according to reports last week. But Charter (CHTR) dismissed the idea late Sunday. "We understand why a deal is attractive for SoftBank, but Charter has no interest in acquiring Sprint," the cable company said in a statement. SoftBank and Sprint didn't immediately respond to requests for comment. Shares in Charter look set to jump at the open. 2. Global stock market overview: The Dow Jones industrial average hit another record closing high on Friday and could keep rallying. 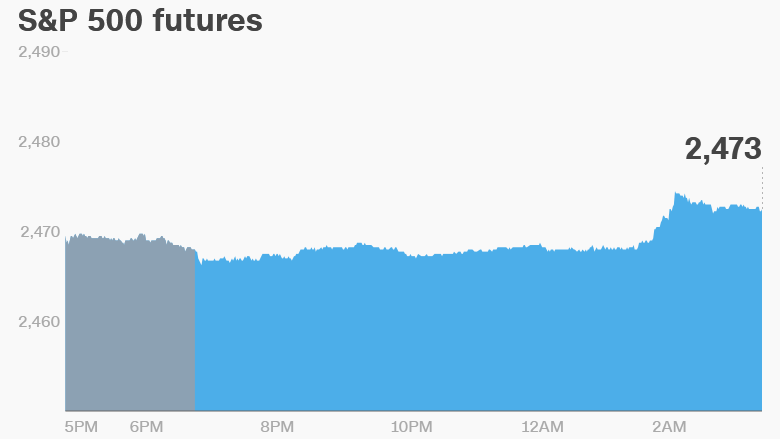 U.S. stock futures were pointing up. European markets were mostly higher in early trade. Asian markets ended the day with positive results. The S&P 500 and Nasdaq also hit all-time highs last week. 3. Earnings: HSBC (HSBC), Sanofi (SNY) and Heineken (HEINY) all reported earnings on Monday. Pandora Media (P) is releasing earnings after U.S. markets close. 4. Watching Venezuela: The U.S. is considering sanctions that would strike at the only source of cash for troubled Venezuela: Oil. Two senior administration officials told CNN Sunday that sanctions could be announced as early as Monday. The Venezuelan government on Sunday held a controversial vote that President Trump and many other critics say will erode any last signs of democracy in the South American nation. The Trump administration on Wednesday slapped sanctions on 13 government and military officials tied to Venezuelan President Nicolás Maduro. Mexico and Colombia followed with sanctions on the same individuals.